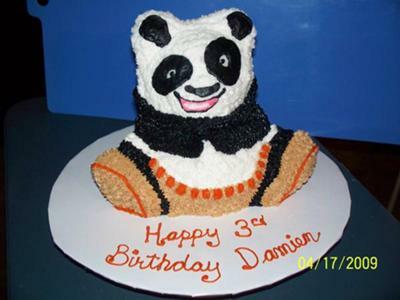 This Kung Fu Panda cake is for my grandson who loves Kung-fu-panda. I used 2 cake mixes but only 6 cups + 2/3 of a cup in the stand up bear pan. I used buttercream icing in light brown, black, white and orange. I tried to make him look like the cartoon but he's not too good. If I had had more time I would have made arms out of fondant so it would be closer. Going to try and make this cake tonight for my son's 2nd birthday. You did an awesome job! Join in and write your own page! It's easy to do. How? Simply click here to return to Character Cakes. Must See Pages for this Month! Our Home Page - Start Here! Sign up for our free newsletter "The Icing on the Cake"
I promise to use it only to send you The Icing on the Cake. Personalized Candy Bar Wrappers make great party favors for any event. Visit our other site for candy wrappers and more.